My mom is unable to eat chocolate, so she's always had a few non-chocolatey sweet treats she favors. Peppermint ice cream, German raspberry candies, and Circus Animal cookies were some of her top picks when I was growing up. Personally, my pick out of those would be the Circus Animals! I've always loved the colors of the rainbow sprinkles against the pink or white frosting. Chocolate preferences aside, it's pretty hard to resist their sugary sweetness. Mom, this one goes out to you! This look is simple and quick. 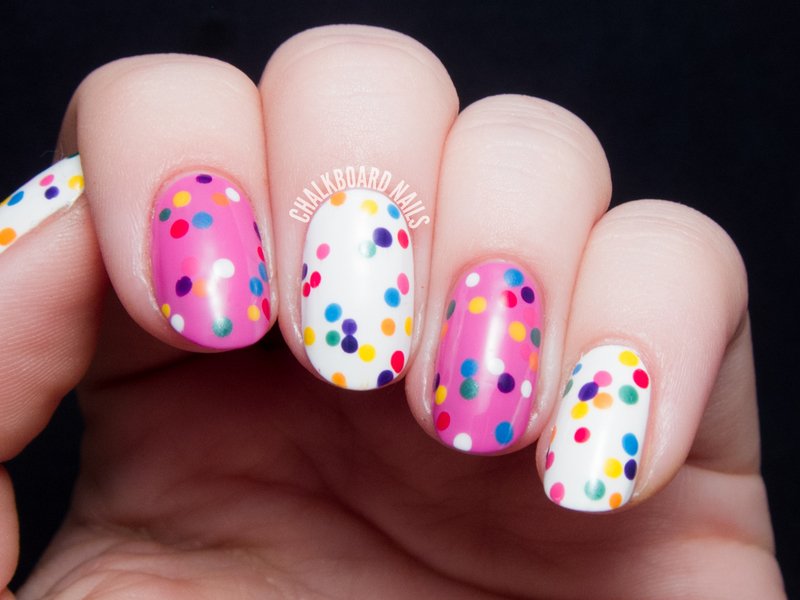 All you need is a dotting tool and the right colors! Truthfully, choosing colors took the most time because I thought getting the right shades was imperative for recreating the Circus Animal sprinkles look. This is also my manicure for The Lacquer Legion's Yummy prompt, because they are yummy in my tummy (duh). Have you had these delicious cookies before? In working on this post, I just discovered a recipe for Circus Animal truffles, which I will have to make AS SOON AS POSSIBLE. So cute and simple! Love it. You nailed it with this one. 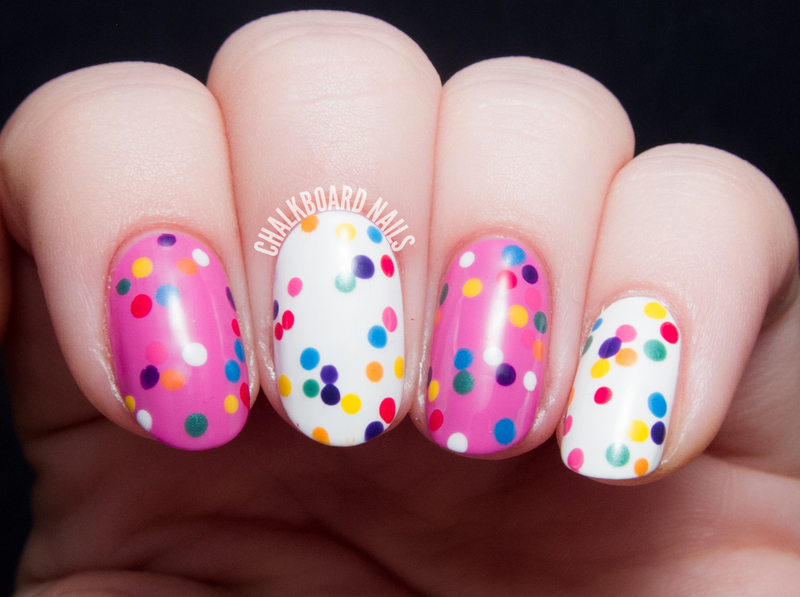 I knew those were circus animal crackers as soon as I saw this fun manicure! I love those cookies too. I eat all the white ones and leave the pink ones for someone else. Ha ha. Great color choices! And I love the randomness - just like the sprinkles! In fact, at first glance I thought it was a glitter topper. 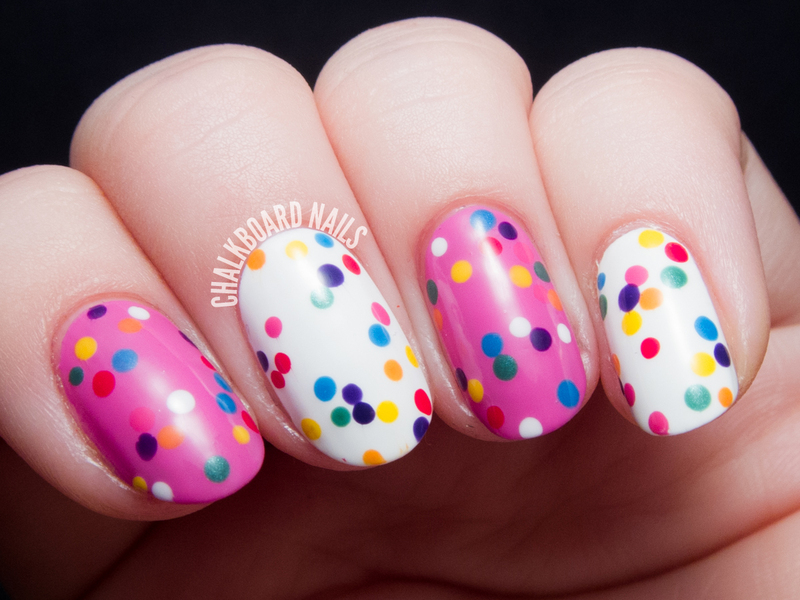 On the thumbnail I thought it was a circle glitter topper, your dots are perfect! Oh no! I've never had Circus Animal cookies! So cute and sweet manicure! Looks great. So cute, and so sweet! I adore this!